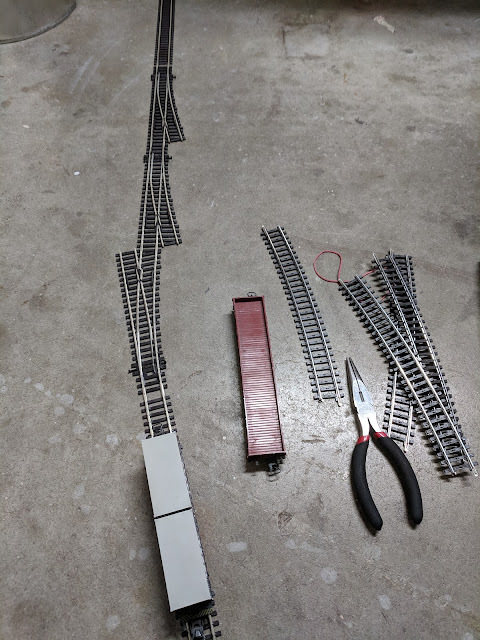 I intend to build my upcoming Untergroeningen project using Peco Streamline Code 100 turnouts and track converted to Maerklin-style 3-rail operation. Adding the center studs to the track is obviously needed for that. However, it turns out that the distance between the insides of the wheels is slightly smaller for NEM 340 (14.0 mm, Maerklin) than NEM 310 (14.4 mm, DC / DCC). 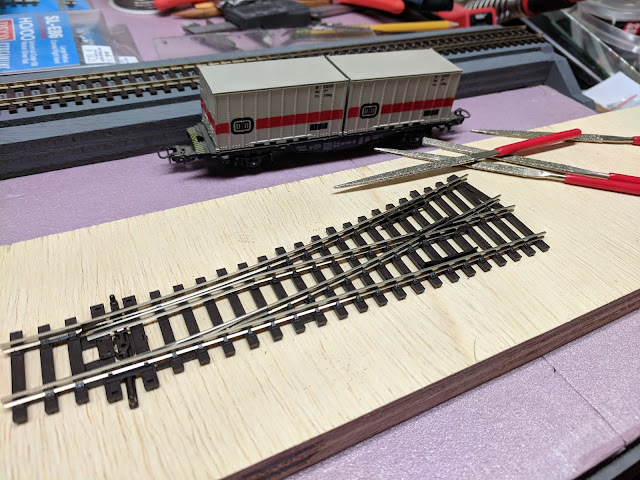 When traversing the diverging route of the "small radius" Peco turnout SL-91, for some long-wheelbase cars this results in binding of the wheel set between the guard rails where the diverging and straight rail meet. Really old cars -- like the brown flat car in the photo below -- even have trouble on the straight route. It seems the solution is to remove about half a millimeter of material on the rail-facing side of the outside guard rails. After filing the guard rails, I laid out some of the turnouts I'm planning to use for Untergroeningen on the garage floor and tried them out with several cars. So far I have not found the need to modify the frog of the turnout, but I would not be surprised if some locomotives need some further work on the track to pass reliably. We'll see what happens when I have the center stud strips installed on the first set of turnouts and run locomotives over the turnouts under their own power.